The Celebs Are Coming To Town!!! Bishopstown, in fact! 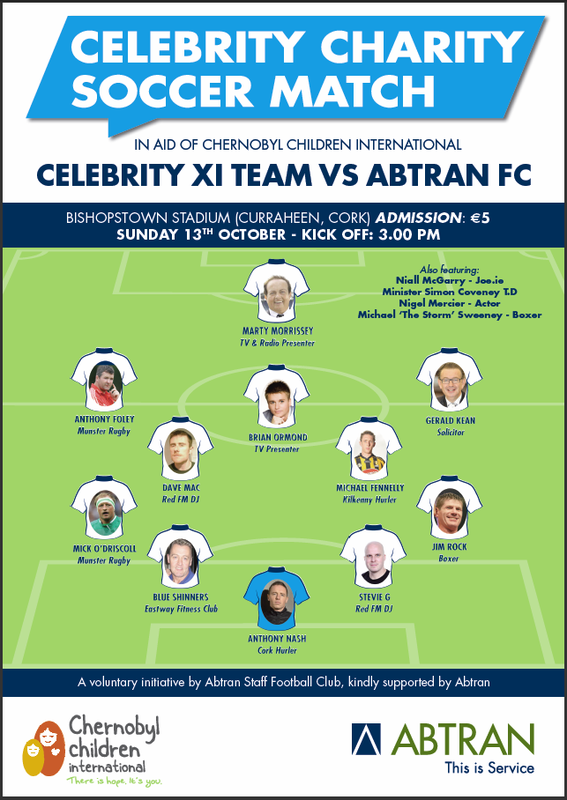 On Sunday 13th October, a team of Celebrities will take to the field at Bishopstown Stadium in Cork to play a one-off soccer match, and all for a great cause. Adi Roche’s Chernobyl Children International charity will benefit from the huge crowds that are anticipated for the game. The Celeb Team is made up of a mixed-bag of people from the sporting and entertainment world. Dusting off their boots will be TV personality Brian Ormond, solicitor to the stars Gerald Kean, ex Munster and Ireland heros Mick O’Driscoll and Anthony “Axel” Foley, Cork All-Star hurling goalkeeper Anthony Nash. While this bunch alone would strike fear into the hearts of any opponents, add in boxers Jim Rock and Michael “The Storm” Sweeney, Bodybuilder and gym owner Blue Shinners, former Hurler Of The Year Michael Fennelly, and this really is a team to be reckoned with. Kick-off on the day is at 3.00pm, and admission is just €5. This promises to be a fantastic fun event, and people are encouraged to come along and watch these celebrities try their best to entertain the crowd. All money raised from the game will go to the Chernobyl Children International charity and will be used to support children living in the aftermath of the Chernobyl meltdown, which although happened over 25 years ago, still affects the lives of thousands and thousands of children from Belarus, Ukraine and Russia. Chernobyl Children International (CCI) was established by Adi Roche in 1991, and over the past 27 years, the charity has evolved to address the long-term medical and economic effects of this unprecedented nuclear catastrophe. As a direct result of the charity’s intervention, the lives of tens of thousands of children have been saved, prolonged or improved. Adi Roche’s lifes work has been to develop programmes that restore hope, alleviate suffering and protect current and future generations in the Chernobyl regions. CCI is founded on hope and courage: the hope that the children—one by one and heartbeat by heartbeat—will thrive; and the courage to envision and create a better world. The Chris Mee Group are proud to sponsor this event, and hopefully it will be an enjoyable occasion for people to attend with family and friends.